*whip-crack* - The man with the hat is back!!! Welcome to the 50th Community Playthrough!!! What better way to celebrate this anniversary edition than with the protagonist whose very name is synonymous with ‘adventure’?! It’s 1939, just before the start of the Second World War. After his adventure in The Last Crusade, Indiana Jones is back at Barnett College. But Nazi agents now have set their sights on a powerful new weapon: the deadly secret that sank the mythical city of Atlantis! Indiana Jones and the Fate of Atlantis is one of my absolute favourite games of all time. It’s the game that got me interested in the adventure genre in the first place, and it’s the game I’ve played and replayed the most. In fact, it’s my go-to game whenever I’m in a bit of an adventuring lull and want to get out of it. 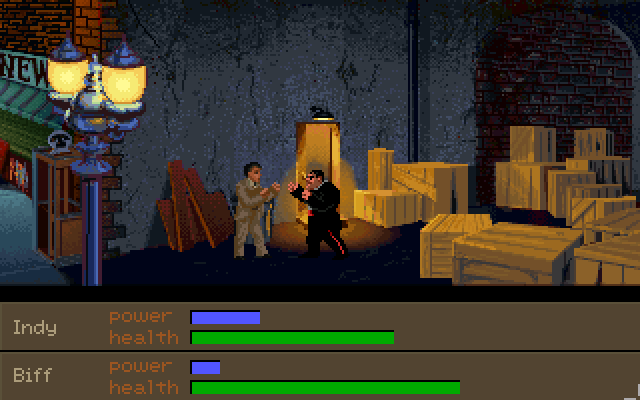 Indiana Jones and the Fate of Atlantis, while a 1992 game, is readily available, should you not have it yet. You can find it on Steam and on GOG, so you can pick your preferred platform. If you do have it, then the game is fully supported by ScummVM and plays perfectly on new systems. In fact, I think both the GOG and Steam versions use ScummVM as well. Should you need help getting it to run, please don’t hesitate to contact me. 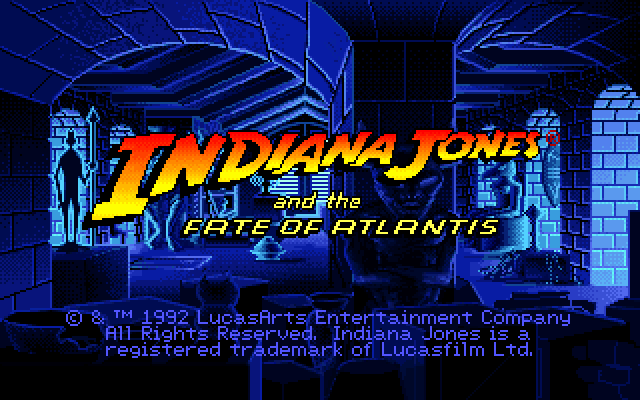 Indiana Jones and the Fate of Atlantis is from the earlier LucasArts batch and uses selectable verbs. If you’re unfamiliar with this system, the verbs are in the bottom left of the screen, and your inventory is in the bottom right. To do something in-game, you click on one of the verbs and then on the object on the screen. Let’s say you want to look at that newspaper (the one the cursor is hovering over in the screenshot), you simply click on “Look at” and then on the newspaper. For your convenience, the most common verbs have been linked to the right mouse-button. Left-clicking on the screen will have Indy walk to the location you clicked, right-clicking will pick an appropriate verb for the object your mouse is hovering over, e.g. “Open” or “Close” for doors, “Talk to” for people, “Look at” for random objects. It’s the verb that’s highlighted (“Look at” in the screenshot). It’s LucasArts, so no deaths and no dead ends, right? Actually, wrong. There ARE deaths in this game, especially if you tend to pick fights with Nazis often (which will be common on the “Fists” path). Do remember to save often, especially in more dangerous (read: Nazi-infested) places! There are no dead ends in the game that I know of, but there is one spot where you could manoeuver yourself into an unwinnable state during a puzzle. It’s only for one short puzzle, however, and I will warn you well in advance. Did you just say “pick fights”? Yes, there is fighting in this game! It is optional, though, unless you’re on the “Fists” path. And even then, the game provides some anti-frustration measures. Fighting with the mouse is clunky, because it involves clicking on a moving target. You can however use your keyboard for fighting. Pressing “F” during the game will turn on the “keyboard fighting mode”. Keyboard fighting is a lot easier and uses the numpad. If your opponent is on your right, then “9” is for a high punch, “6” is for a middle punch, and “3” is for a low punch. Blocking is done with the middle column: “8” is for a high block, “5” is for a middle block and “2” is for a low block. “4” is for taking a step back. If your opponent is on your left, then the keys are mirrored (with “7”, “4” and “1” being for punching, and “6” being for taking a step back). Warning: taking too many steps back will have Indy backing out of the fight entirely to lick his wounds. In the very first (optional) fight of the game - the one from the screenshot above -, you’ll only get knocked out should you lose, but in all other fights (against Nazi soldiers), losing means dying, so save before fighting! Don’t like the fighting? Or find it too difficult? There’s an easy way out: use the game’s “instant-win” option. The game contains a “sucker-punch” which will knock out your opponent in a single hit. Press “0” (or “Insert”) for this. The punch has to connect, so you may have to press it a few times during a fight. The “sucker-punch” will work on all but two opponents in the game, and those two fights can be avoided by puzzles. Be warned, however, that using the “sucker-punch” will not net you any points for your “Indy Quotient” in the game. 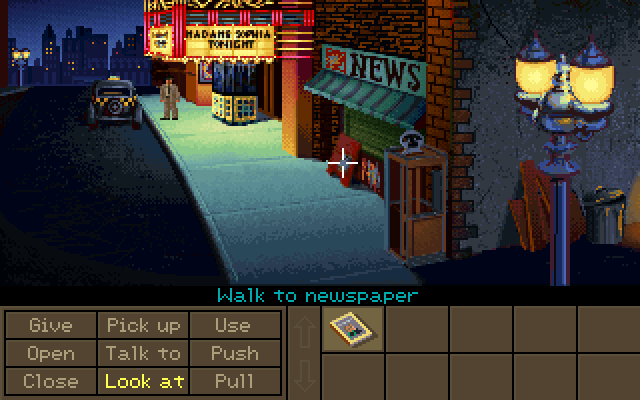 Yes, LucasArts took a page out of the Sierra playbook and added a points-system in this game, called the I.Q. (or “Indy Quotient”). Advancing in the game will net you points, but to get all the points in the game (1000 points! ), you’ll need to play through it multiple times, trying all alternative puzzle solutions, and even fighting (and beating) one nigh-invincible opponent. The points are just for fun, so I wouldn’t pay much attention to them. If you’re curious, however, you can press “I” during the game to bring up your I.Q. tally. It will show up in the bottom right, instead of your inventory. Pressing “I” again will then bring back the inventory. I heard there are multiple paths and multiple endings? Yes, at a certain point in the game, you’ll be presented with a choice on how to continue. Your answer determines which one of three different branches you’ll follow in the game. Each branch has similar locations, but different puzzles, enhancing the replayability of the game. All three branches converge at the same spot, though, so the final section of the game will be the same for each branch. There are multiple endings as well (four, to be precise), but one of these merely consists of Indy dying in the final puzzle. There are three proper endings, and only one of those is the “good ending”. The “bad endings” are achieved by *not* doing something optional close to the end, but frankly, except for the times I’ve actively gone for these endings, I’ve always wound up with the good ending. How will the playthrough work? The three branching paths are similar (you visit several of the same locations, talk to several of the same people), but the puzzles in these locations (and the things you do in general) are mostly different, so they warrant three playthroughs. And all three paths converge before the end with the final act being identical for all. That’s why it’s my intention to play all three paths in a row, essentially going back a bit in the story to try a different route each time. The “Fists” path is easier on the puzzles but has more fights. The “Team” path has more puzzles and more character interactions with our female companion. The “Wits” path has the most puzzles. December 9th - December 16th: play Act One until the branching point, SAVE THERE!!! Dates may change, if players that are new to the game have difficulty catching up. And I added a couple of days more during the holidays, because some will probably have more time to play, but others definitely won’t (with Christmas and New Year’s obligations). Finally! Was all that verbosity really necessary? Indy’s a man of action, not words! You have until December 9th to get the game, get it running, and play the prologue. No need to save once you do - the prologue is just an intro, and hitting “Esc” three times gets you to New York just as easily. Please leave a message here once you’ve got the game up and running, and have played the prologue. And please inform us of your history with Indiana Jones and the Fate of Atlantis. Have you played it before, or have you played it several times already? When did you first play it? I probably won’t be joining the playthrough, because I’ve played this game far too many times already, but I worked out the full points list some years ago, and I thought I’d post it here in case someone wants to go for the full 1000-point run. Will try to order and get the game up and running tonight. OK! Minor problem. Where is the main menu. I got the game up and running and went through the prologue. I drove to where I am now ... at the point you said to stop. But now I don’t know how to save the game. I’ve clicked on all the usual suspects, e,g, Esc, Enter, Spacebar etc., but nothing brings up the main menu. You need to press F5 (fn + f5 on laptops). I’m a huge fan of Indiana Jones! I’ve watched all the movies many, many times and played pretty much every game that exists. Fate of Atlantis though is by far my favorite. With that said, the game is installed and ready. I’ll patiently be waiting outside the theater til Dec. 9th. PS. As with all games using ScummVM you can use the built in graphics filters if you want to smooth the graphics so they are less pixelated. Also if you want to enjoy the midi music the way it was truly meant to be enjoyed then I highly recommend using a free 3rd party midimapper and a good soundfont. Windows no longer has a midimapper and uses an old outdated soundfont that is total garbage! If anyone would like a walkthrough on how to do so feel free to PM me. PPS. Kurufinwe, thanks for that detailed point list. It should come in handy for all the completionists such as myself. This message will self destruct in 3… 2… 1… BOOM!!! The ScummVM menu comes up with ‘F5’. No real need to save at this point, though. Just starting the game and tapping ‘Esc’ three times will automatically start you in New York City. The prologue is just a playable intro scene. F5 was not one of the keys I hit in search of the menu. Maybe that’s due to the fact that I played a heck of a lot more Sierra games than LucasArts. Iveryone who has ever played a LucasArts game probably knows that F5 is the key to hit. I’ve got four days until the 9th. So I’ve got time. I may have to re-install the game. The way it appears to have installed is that I’m playing the game via the GoG cloud rather than playing from files that actually exist on my computer. When I installed Post Mortem and Kathy Rain, for example, I was asked whether I wanted a game icon installed on my desktop. I don’t recall being asked that question when I installed FoA. Also the game icon in the appropriate game file is a shortcut rather than an .exe file. And, finally, the whole FoA file folder is only 256 MB, which seems a little small. Maybe someone can tell me whether I’m just barking up a tree, and everything is fine. Same here! I’m currently rewatching the Young Indiana Jones Chronicles just to get in the mood (and a desperate attempt to try and capture the feeling of being 11 years old again). It’s still great. First time I played FOA was in 95, second adventure game I ever played. Traded it with a classmate (the hint book was included). Spoiler for those who haven’t finished the intro. Still cracks me up that the statue is always in the last locker you look in. F5 is the ScummVM menu. The original FoA menu was brought up with F1 which is no longer relevant since it’s using the ScummVM engine. As for the folder size, yes the full game is installed, they were much smaller back then. The GoG cloud only keeps your save games safe for future access, so it’s up to you whether or not you use it. Oh man it’s been many years since I’ve watched the Young Indiana Jones Chronicles. Such a great show! I have the original Macintosh CD which I bought on eBay many years ago but never played. I will see how it installs in ScummVM tomorrow. I spent the day rearranging furniture and clearing out stuff for Goodwill, so I plan to veg for the rest of the night. I’ve never played the game before so thought I would try & join in with this playthrough. Unfortunately, since GOG updated their site I’ve been unable to access the GOG store to buy anything at all so I’ve just got the game from Steam, installed it & played through the prologue. Is the game supposed to play in a small window? Lady K, chrissie! Welcome aboard, you guys are in for a treat! chrissie, Alt+Enter should do the trick. I think it would be simpler if you just posted the fixes here, in spoiler mode if you think that is the way to go, rather than having to answer 10 or 15 individual PMs asking for the same information. Or, if it’s simpler, do what Kuru did. and post a link to the information. To those who are interested I will be explaining how to enable the graphic filters as well as how to improve MIDI audio, hopefully it will not be too confusing. If you have any questions feel free to PM me. Once the game is running press Ctrl+F5 (ctrl+fn+f5 on laptops) to bring up the ScummVM menu. Choose “Return to Launcher” then make sure Indiana Jones and the Fate of Atlantis is highlighted and choose “Edit Game…”. Click on the Graphics tab. Make sure Override global graphic settings is checked. Choose Graphics mode: 2x, leave Render mode: <default>, and make sure Aspect ratio correction and Fullscreen mode are both checked as well. Click OK and start the game, you will now be able to switch through the different filters by pressing Ctrl+Alt+1-8. Next you will need to setup ScummVM to use your new “superior” VirtualMIDISynth device. Once again while the game is running bring up the ScummVM menu, choose “Return to Launcher”, then choose “Options…” and click on the Audio tab. Choose Preferred Device: VirtualMIDISynth #1 [Windows MIDI], leave Adlib emulator and Output rate: <default>, click OK. Next click on the MIDI tab. Choose GM Device: VirtualMIDISynth #1 [Windows MIDI], click on SoundFont: choose the location of the soundfont file you downloaded. Click OK and you are done. Start the game! You should now have an improved “graphical and musical” Indy experience! PS. The MIDI audio portion of this guide is for Microsoft Windows only, my apologies to Mac users! PPS. TimovieMan, I failed to mention this earlier, wonderful job on the introduction! the game is ready since forever, skipped the intro (remember it from a no-so-far try to replay) and ready to go. Upcoming 3rd person point & click games?